The NASA robot continues to rove the unforgiving slopes of Mount Sharp, but dramatic signs of damage are appearing on its aluminum wheels. 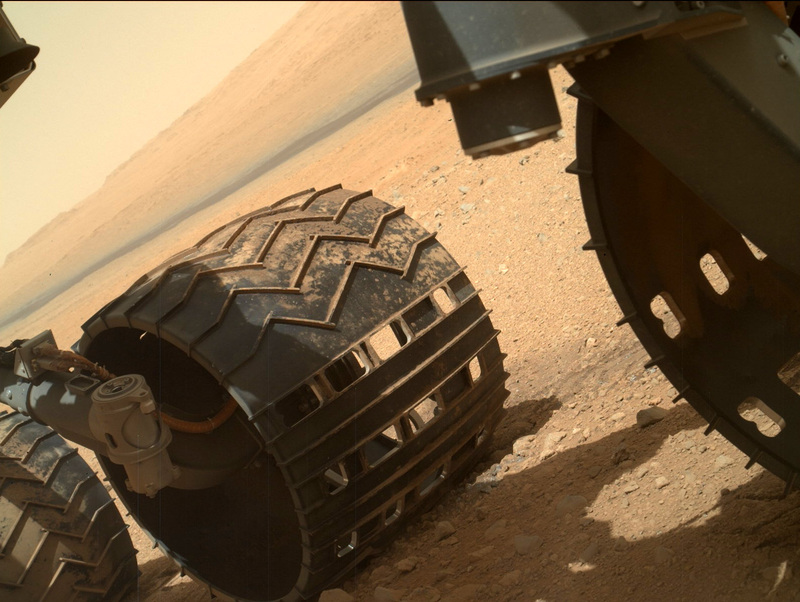 In 2013, earlier than expected signs of damage to Curiosity’s wheels were causing concern. Four years on and, unsurprisingly, the damage has gotten worse. 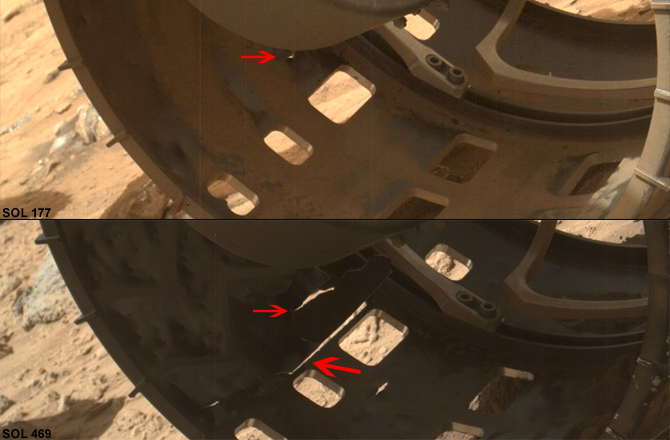 The visible signs of damage have now gone beyond superficial scratches, holes and splits — on Curiosity’s middle-left wheel (pictured above), there are two breaks in the raised zigzag tread, known as “grousers.” Although this was to be expected, it’s not great news. 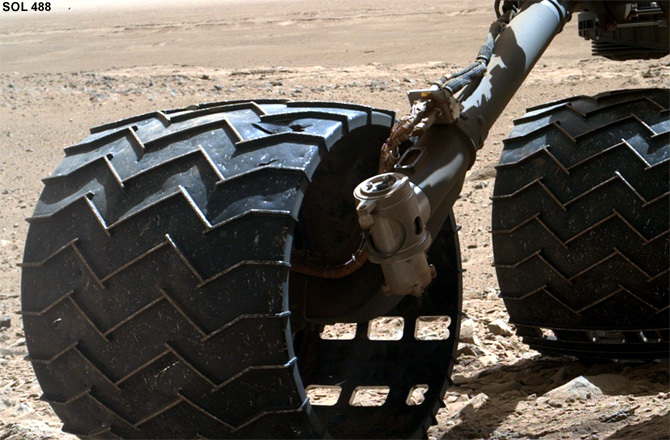 The damage, which mission managers think occurred some time after the last wheel check on Jan. 27, “is the first sign that the left middle wheel is nearing a wheel-wear milestone,” said Curiosity Project Manager Jim Erickson, at NASA’s Jet Propulsion Laboratory (JPL) in Pasadena, Calif., in a statement. 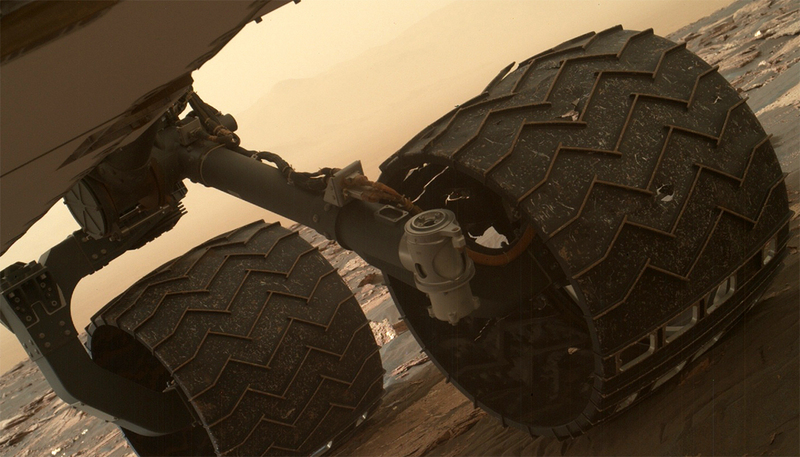 After the 2013 realization that Curiosity’s aluminum wheels were accumulating wear and tear faster than hoped, tests on Earth were carried out to understand when the wheels would start to fail. 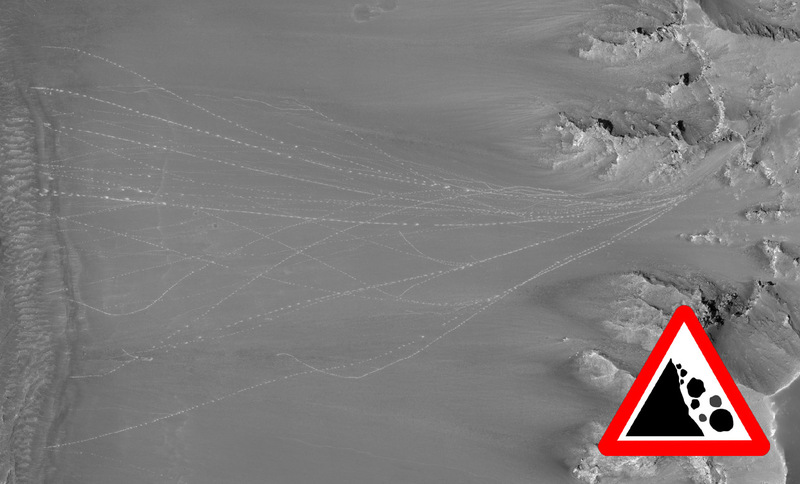 To limit the damage, new driving strategies were developed, including using observations from orbiting spacecraft to help rover drivers chart smoother routes. It was determined that once a wheel suffers three grouser breaks, the wheel would have reached 60 percent of its useful life. Evidently, the middle left wheel is almost there. According to NASA, Curiosity is still on course for fulfilling its science goals regardless of the current levels of wheel damage. “This is an expected part of the life cycle of the wheels and at this point does not change our current science plans or diminish our chances of studying key transitions in mineralogy higher on Mount Sharp,” added Ashwin Vasavada, Curiosity’s Project Scientist also at JPL. While this may be the case, it’s a bit of a downer if you were hoping to see Curiosity continue to explore Mars many years beyond its primary mission objectives. 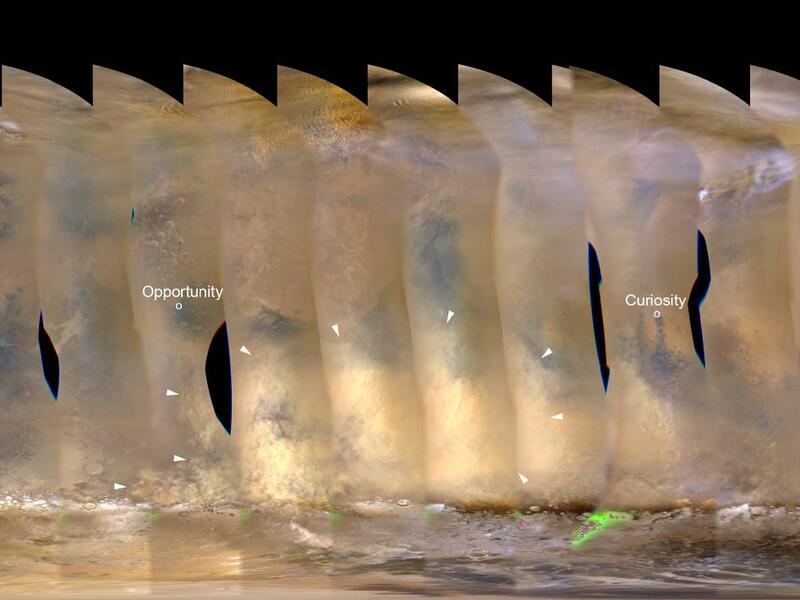 Previous rover missions, after all, have set the bar very high — NASA’s Mars Exploration Rover Opportunity continues to explore Meridiani Planum over 13 years since landing in January 2004! But Curiosity is a very different mission; it’s bigger, more complex and exploring a harsher terrain, all presenting very different engineering challenges. Currently, the six-wheeled rover is studying dunes at the Murray formation and will continue to drive up Mount Sharp to its next science destination — the hematite-containing “Vera Rubin Ridge.” After that, it will explore a “clay-containing geological unit above that ridge, and a sulfate-containing unit above the clay unit,” writes NASA. Since landing on Mars in August 2012, the rover has accomplished an incredible array of science, adding amazing depth to our understanding of the Red Planet’s habitable potential. To do this, it has driven 9.9 miles (16 kilometers) — and she’s not done yet, not by a long shot. Around 3.5 billion years ago — when basic life was just gaining a foothold on Earth — the Tharsis region on Mars was swamped with vast floods that scar the landscape to this day. Mars wears its geological history like a badge of honor — ancient craters remain unchanged for hundreds of millions of years and long-extinct volcanoes look as if they were venting only yesterday. This is the nature of Mars’ thin, cold atmosphere; erosional processes that rapidly delete Earth’s geological history are largely absent on the Red Planet, creating a smorgasbord of features that provide planetary scientists with an open book on Mars’ ancient past. In this latest observation from the European Mars Express mission, a flood of biblical proportions has been captured in all its glory. But this flood didn’t happen recently, this flood engulfed a vast plain to the north of the famous Valles Marineris region billions of years ago. It is believed that a series of volcanic eruptions and tectonic upheavals in the Tharsis region caused several massive groundwater releases from Echus Chasma, a collection of valleys some 100 kilometers (62 miles) long and up to 4 kilometers (2.5 miles) deep. These powerful bursts of water carved vast outflow channels into the adjacent Lunae Planum, contributing to the formation of the Kasei Valles outflow channels, releasing water into the vast Chryse Planitia plains which acted as a “sink.” Smaller “dendritic” channels can be seen throughout the plain, indicating that there were likely many episodic bursts of water flooding the region. These floods happened between 3.4 to 3.6 billion years ago, less than a billion years after the most basic lifeforms started to appear on Earth (a period of time known as the Paleoarchean era). In the middle of what was likely a powerful, vast and turbulent flows of water is Worcester Crater that was created before the Tharsis floods and, though its crater rim stands to this day and retains its shape, it was obviously affected by the flow of water, with a “tail” of sediment downstream. Also of note are smaller “fresh” craters that would have appeared long after the flooding took place, excavating the otherwise smooth outflow channels. These younger craters have tails that seem to be pointed in the opposite direction of the flow of water. These tails weren’t caused by the flow of water, but by the prevailing wind direction. From orbital observations by our armada of Mars missions, it is well known that these channels contain clays and other minerals associated with the long-term presence of water. Although the Red Planet is now a very dry place, as these beautiful Mars Express images show, this certainly hasn’t always been the case. As NASA has been shuttered by the insane U.S. government shutdown, there’s been little in the way of news releases from NASA (site offline) or NASA’s Jet Propulsion Laboratory (site still online, but no recent updates posted). In this Mars Science Laboratory science lull, I’ve found myself obsessively trawling the mission’s raw image archive so I can get my fix of high-resolution imagery from Curiosity’s ongoing mission inside Gale Crater. While getting lost in the Martian landscape once more, I started tinkering with Curiosity’s raw photos; zooming in, adjusting the contrast, brightness and color. 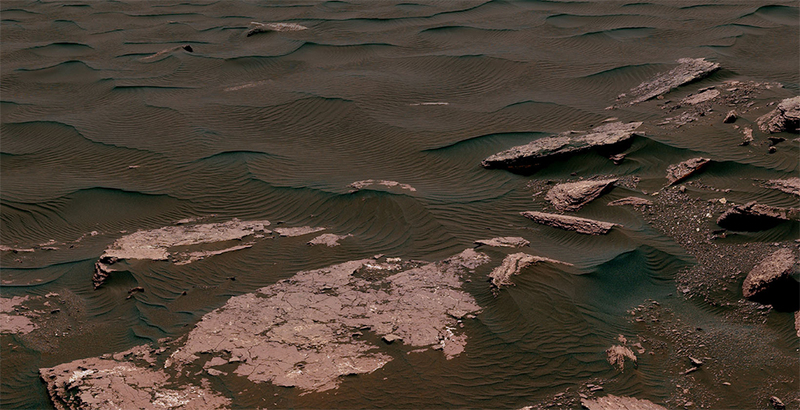 One thing led to another and I found myself stitching together various photos from the rover’s Mastcam camera. Being awash with photographs with little professional insight from mission scientists (as, you know, a noisy minority at Capitol Hill has gagged them by starving the agency of funds), I started to tinker in Photoshop, blindly trying to stitch a selection of Mastcam photos together to see an updated Martian panorama once more. This is the result. Of particular interest, I found myself staring at the precariously-shaped boulder to the far right of the panorama. I can only guess what geological processes shaped it that way — Wind action? Ancient water flow? — or whether it had simply landed that way after getting blasted from an impact crater, but I was curious as to what JPL mission scientists are making of it. 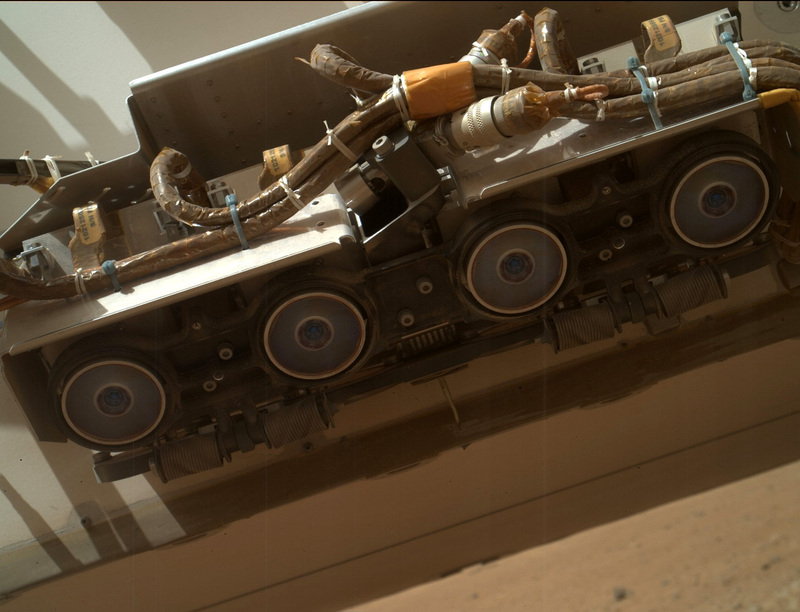 Alas, we’ll have to wait a little longer for the awesome Mars science to begin flowing again. It felt nice to be absorbed in the Mars landscape again. The photo stitching is rough in places (by far the hardest task was getting the brightness and contrast correct in each photo) and I lack any calibration tools to ensure the color is correct or that the orientation is sound, but it satisfied my curiosity as to what Curiosity was up to on the Red Planet. It has, after all, been over a year since the historic landing of the NASA mission and the regular news updates from NASA and JPL have become something of an intellectual opiate. Going cold turkey, apparently, makes a space blogger itchy. Colonists Beware: Don’t Camp at the Bottom of Martian Hills! 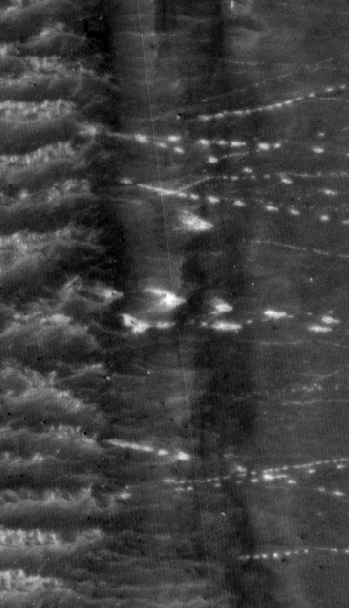 Trails of Mars rocks that have rolled down the slope of a crater rim as imaged by the HiRISE camera. Credit: NASA/JPL/Univ. of Arizona. It’s always fascinating to see evidence of active geological processes on Mars. And with the help of the armada of robots in orbit and roving the Red Planet, there are plenty of opportunities to see the planet in action. Take this recent image from the High-Resolution Imaging Science Experiment (HiRISE) camera aboard NASA’s Mars Reconnaissance Orbiter (MRO) for example. In this striking scene — which is a little over one kilometer wide — the bright trails of rocks that have rolled down a sloping crater rim after being dislodged from the top are visible from space. The rocks have obviously bounced on their way, leaving dotted impressions as they rolled. Some have reared in wide arcs, following the topography of the landscape. Others have hit other rocks on their way down, dislodging them, creating secondary cascades of smaller boulders. 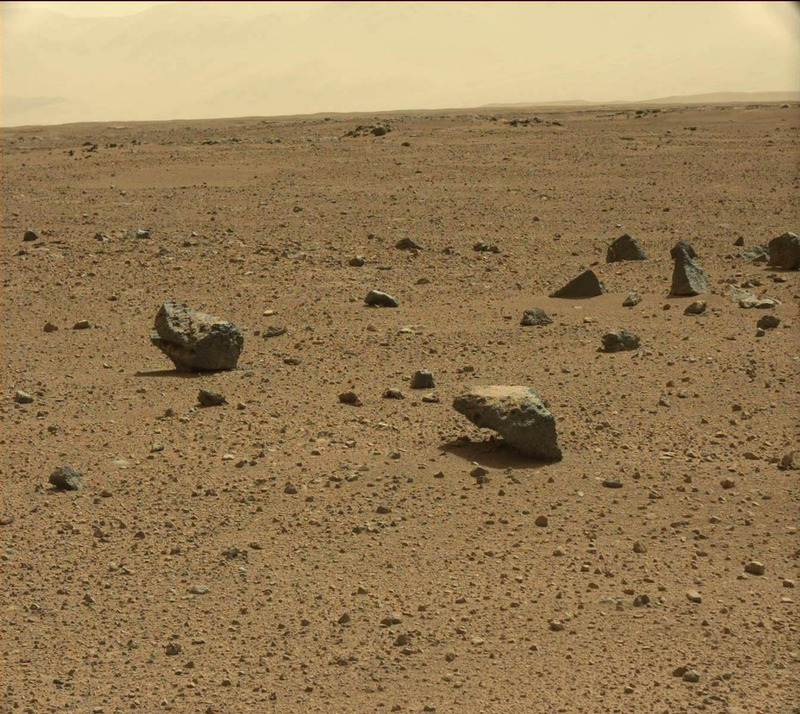 A rough estimate from the high-resolution imagery suggests some of these Mars boulders are over a meter wide. Future Mars astronauts beware: don’t camp out at the bottom of Martian hills! There’s no vegetation to hold big rocks in place or slow their speed. 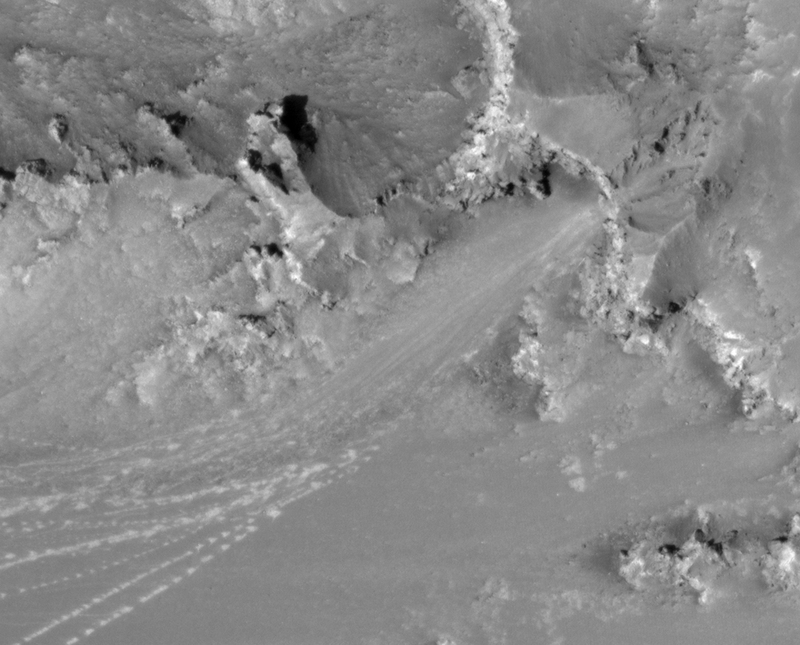 As previous observations of Mars “avalanches” suggest, weathering through the expansion of water ice (frost action) and/or rapid vaporization of carbon dioxide ice likely trigger pretty extreme downfalls of debris. It would be a bummer to travel all the way to Mars, survive the ravages of solar radiation, a daring descent and landing only to get flattened by a wayward chunk of rock when you set up camp. I’ve always had a special joy for surveying HiRISE observations; it’s a very privileged window to this alien landscape that, in actuality, has many similar geological processes we find on Earth. And so here we have a collection of boulders that, somehow, became dislodged and stormed down from the rim of a crater. If we saw such an event in person, we might note the unnatural bounce these boulders have in the roughly one-third Earth gravity. But we’d also have to find shelter fast, as just like rolling boulders on Earth, those things will flatten you. Author Ian O'NeillPosted on May 8, 2013 May 8, 2013 Categories Mars, Solar SystemTags HiRISE, Mars, MRO, NASA2 Comments on Colonists Beware: Don’t Camp at the Bottom of Martian Hills! As the sols march on, NASA’s brand new nuclear-powered rover Curiosity has detected a dramatic change in its surrounding atmosphere. A once-clear vista of the distant rim of Gale Crater now looks smoggy — almost like the gray-brown-yellow stuff that hangs above Los Angeles on a hot summer’s day. So what’s causing this change in opacity? As can be seen in the above global view of Mars, NASA’s Mars Reconnaissance Orbiter took a near-continuous observation of the planet on Nov. 18 with its Mars Color Imager. 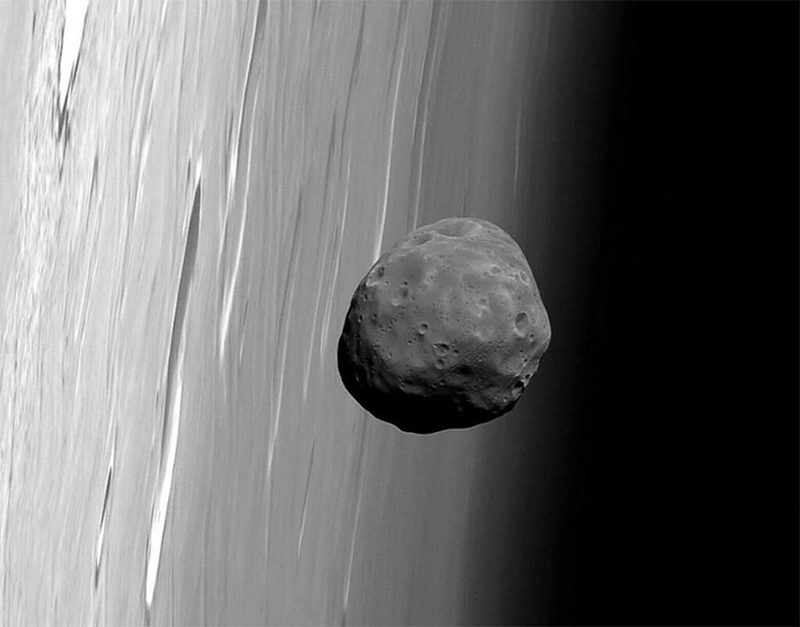 The mosaic has picked out an assortment of geographical features, but there’s one rather ominous atmospheric feature (white arrows) that grabbed the attention of Malin Space Science Systems’ Bruce Cantor. A regional dust storm is brewing and Cantor first observed the storm on Nov. 10. He reported the detection to NASA’s Mars Exploration Rover team who manage Opportunity. Although the storm is over 800 miles from the tenacious rover, dust storms are of a concern for any solar powered surface mission, especially for a rover that has outlived its expected mission lifetime by several years. Opportunity’s solar panels are already covered in dust, so should there be an additional dip in sunlight due to a dusty atmosphere there could be an impact on its mission. Additional dust layers on the panels wouldn’t help either. Opportunity does not have a weather station, but its cameras have detected a slight drop in atmospheric clarity. Curiosity, on the other hand, does have a weather station — called the Rover Environmental Monitoring Station (REMS) — and has been closely monitoring the atmospheric variability over the last few days, detecting a decreased air pressure and a slight rise in overnight low temperature. This is in addition to the dramatic loss in visibility. In short, it sounds like Curiosity can sense a storm in the air. Now this is the cool bit. We currently have an armada of Mars orbiters, plus two generations of Mars rovers doing groundbreaking work on opposite sides of the red planet. We are in an unprecedented age of planetary exploration where a network of robots all work in concert to aid our understanding of how the planet works. In this case, local weather changes are being observed around two surface missions while corroborating data is being gathered hundreds of miles overhead. Starting on Nov. 16, the Mars Climate Sounder instrument on the Mars Reconnaissance Orbiter detected a warming of the atmosphere at about 16 miles (25 kilometers) above the storm. Since then, the atmosphere in the region has warmed by about 45 degrees Fahrenheit (25 degrees Celsius). This is due to the dust absorbing sunlight at that height, so it indicates the dust is being lofted well above the surface and the winds are starting to create a dust haze over a broad region. Warmer temperatures are seen not only in the dustier atmosphere in the south, but also in a hot spot near northern polar latitudes due to changes in the atmospheric circulation. Similar changes affect the pressure measured by Curiosity even though the dust haze is still far away. We’re monitoring weather on another planet people! If that’s not mind-blowing, I don’t know what is. Note: Apologies for the Astroengine.com hiatus, I’ve been somewhat distracted with writing duties at Discovery News and Al Jazeera English. If you’re ever wondering where I’ve disappeared to, check in on my Twitter feed, I tweet a lot!